I was a little unsure about a "bean" chip. I did not think my kids would enjoy them, and I thought I may not either. I enjoy health food, but only if it tastes good AND is healthy. 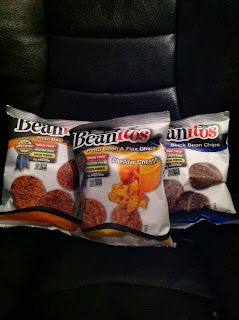 Beanitos sent several varieties: Cheddar Cheese, BBQ Chipolte, Pinto Bean and Flax, and Black Bean. The chips themselves are the shape of a chip, and look like chips, but there are clear differences in terms of color and texture. All three of my children were a bit hesitant to try them out when they arrived. I opened a bag of the Pinto Bean and Flax first . . . delicious. I convinced my oldest to try one. She fell in love with the with the first bite and grabbed her own bag (she tried Cheddar Cheese next). My two year old was then eager to try them, and she loved them as well and begged for her own bag (Black Bean). My son tried one, and did not care for him. However, my son survives on Corn Dogs and Waffles . . . and is VERY particular about food. The fact that he did not spit it out was a HUGE compliment. I did put some in his lunchbox this week, and he DID eat them. 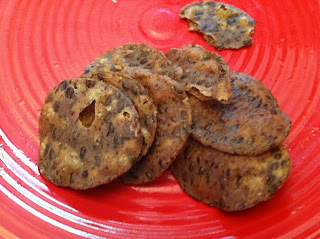 When my husband came home, he did not want to try them (he is used to me bringing home health food). My oldest daughter convinced him by telling him they were the best chips ever. He LOVED them as well! Me-- BBQ Chipolte-- both sweet AND spicy! Son (5)-- DID eat the Cheddar Cheese at lunch, which must mean he REALLY liked them! Overall, we are now a Beanitos family. The chips may sound a little odd, but once you taste them you will be completely won over! I received Beanitos to sample for purposes of review here on MamaBreak. I did not receive any other sort of compensation. As always, my experiences and opinions are my own. OMG! I haven't tried these but they look delicious. Thanks for sharing this great review. I'm going to have to look for these next time I'm out shopping.